In the digital era, the body can sometimes seem forgotten – even invisible. Dance on the other hand is body-dependent. Yet here too, technology is playing an ever-greater role. 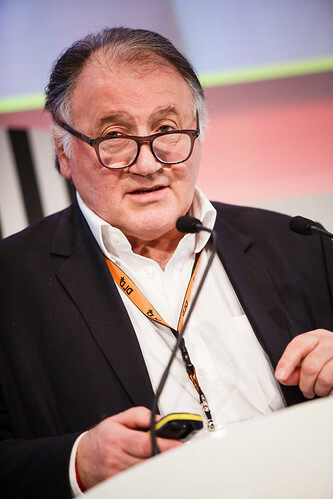 To explore how dance, technology, art and the body all fit together, the artist and professor Peter Weibel is taking a look back at evolution in the arts at DLD14. Weibel explains that there was once a divide in art between time-based art, such as poetry or music, and space-based art, like painting or sculpture. But over the years and through innovative artists, that divide was eroded and even turned on its head. We’ve seen action painting by Jackson Pollock, performance painting by Yves Klein, sculptures as music by Gilbert and George or even performance as installation, by Marina Ibramovic. The choreographer Sasha Waltz is another one of these innovative artists. “One of the reasons we need a new taxonomy”, says Weibel, who recently received the Austrian Oskar-Kokoschka prize for his contributions to the art world. A four-minute clip of Waltz’s work showcases how her pieces cross the divide between dance, installation, technologies and the human body – although unfortunately the sound doesn't work. Sometimes tech problems hinder even digital conferences. During the clip and as Weibel continues explaining how technology has changed the art world, the dancer Emmanouela Nikoli Dolianiti has been preparing herself next to the stage. She is pouring one bottle of dry rice after another into her flesh-coloured tights. Dolianiti is going to be performing Family Tree choreographed by Sasha Waltz. The piece was recently one of the installations showcased at ZKM, Center for Art and Media in Karlsruhe, of which Weibel is chairman and CEO. After a brief introduction by Weibel, Dolianiti begins slowly walking in front of the stage. Overhead a video of the Family Tree piece is projected. Weighed down by the rice, her steps are hampered yet fluid, the shape of her legs unnatural yet organic. It’s an unexpected performance, but one the DLD14 audience seems to enjoy. Many take photos and clap enthusiastically at the end.